The aptly named Take The Crown was a new entry at the top of the album charts while Candy, his 14th number one, stayed at the top of the singles chart for a second consecutive week. The double was achieved despite BBC Radio 1 failing to put Candy on its Breakfast Show playlist because Williams does not appeal to its audience. Programme chiefs decided the song was not appropriate for the target audience of 15 to 29-year-olds but it became his first solo number one for eight years despite the lack of coverage on the prime time show. 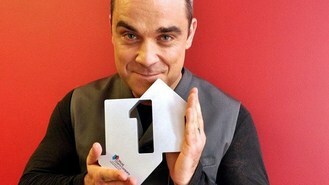 Take the Crown was Williams' tenth number one album in 15 years as a solo artist, and it was the second time he has topped both charts simultaneously, according to the Official Charts Company. The last time he did the double was in December 2001 when Something Stupid, his duet with actress Nicole Kidman, hit the top spot during his easy listening covers album Swing When You're Winning's seven week stay at the top of the album chart. The singer became a father in September after wife Ayda gave birth to their first child Theodora Rose. Labrinth FT Emeli Sande spent a second week at number two with former chart-topper Beneath Your Beautiful. English-Irish boy band The Wanted scored their seventh top three place with I Found You and Adele's James Bond theme Skyfall climbed one place to Number 4. Swedish House Mafia rounded off the top five with Don't You Worry Child. In the album chart Williams was the highest of four new entries in the top five. Dutch violinist Andre Rieu came in at number two with Magic Of The Movies, his collection of film score classics, while JLS' fourth album Evolution entered the chart at number three. Last week's number one, Calvin Harris's 18 Months, separated them at number four from the Military Wives Choir, whose new album Stronger Together entered at number five.